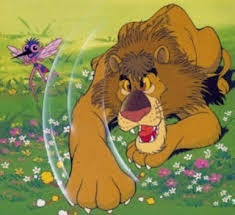 Once upon a time....a tiny mosquito started to buzz round a lion he met. ''Go away!'' grumbled the sleepy lion, smacking his own cheek in an attempt to drive the insect away. ''Why should I?'' demanded the mosquito. ''You're king of the jungle, not of the air 'll fly wherever I want and land wherever I please. ''And so saying, he tickled the lion's ear. In the hope of crushing the insect, the lion boxed his own ears, but the mosquito slipped away from the now dazed lion. ''I don't feel it any more. Either it's squashed or it's gone away.'' But at that very moment, the irritating buzz began again, and the mosquito flew into the lion's nose. Wild with rage, the lion leapt to his legs and started to rain punches on his nose. But the insect, safe inside, refused to budge. With a swollen nose and watery eyes, the lion gave a terrific sneeze, blasting the mosquito returned to the attack: BUZZ....... BUZZ!......it whizzed round the lion's head. Large and tough as the lion was, he could not rid himself of his tiny tormenter. This made him angrier still, and he roared fiercely. At the sound of his terrible voice, all the forest creatures fled in fear, but paying no head to the exhausted lion, the mosquito said triumphantly: There you are, king of the jungle! Foiled by a tiny mosquito like me! '' And highly delighted with his victory, off he buzzed. But he did not notice a spider's web hanging close by, and soon he was turning and twisting , trying to escape from the trap set by a large spider. ''Bah! ''said the spider in disgust, as he ate it. ''Another tiny mosquito. Not much to get excited about, but better than nothing. I was hoping for something more substantial....'' And that's what became of the mosquito that foiled the lion!